Big data analysis runs on less expensive hardware, delivering faster results that are easier for IT teams to maintain, thereby reducing the total cost of ownership (TCO) without compromising on performance. By bringing the calculations to the data, big data can efficiently coordinate distributed analysis and eliminate the need for pooling, even on tens of millions of records. Provides ALM analytics, including gap analysis, discounted gaps with cash flow slotting for BCBS 368, NII, EaR, EVE, VaR, FTP, hedge accounting, CSRBB and expected credit losses. Includes cash flow projection across banking book and trading book, liquid asset modeling, secured financing and haircuts/liquidation schedules. Delivers an extremely extensible framework, enabling clients to use user-defined expressions, Python code and C++ for incorporating virtually any proprietary models. Algo ALM and Liquidity Risk on Big Data provides an extremely intuitive browser-based interface for parameterizing and running the solution. This interface brings configuration and ad-hoc sand-boxing of product and market data, scenarios, banking book assumptions and outputs into the hands of the business user. Algo ALM and Liquidity Risk on Big Data support comprehensive scenario analysis and stress testing. Any risk factor in the system can be stressed deterministically or stochastically, including interest rate curves, basis spreads, forex (FX), behavioral assumptions, haircuts, credit spreads, volatilities, inflation and macroeconomic variables. Big data technologies support powerful reporting through Hive with “schema-on-read” features. These features interact with all risk engine inputs, outputs and log files stored in the Hadoop Distributed File System (HDFS). 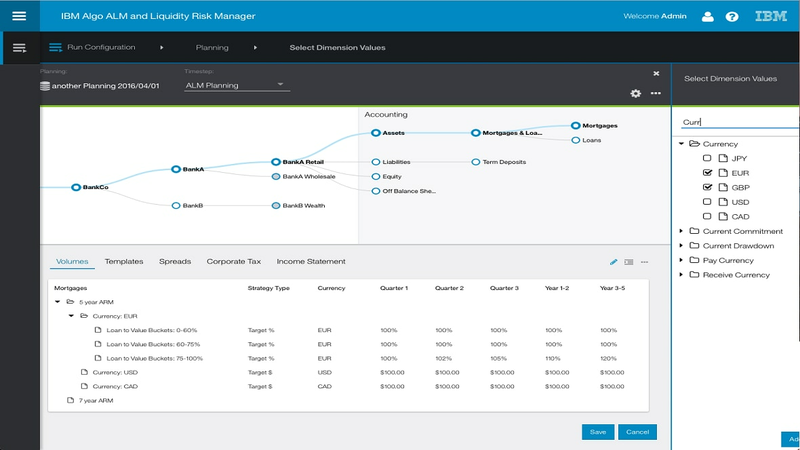 The solution supports compliance with multiple regulations, including Basel III liquidity coverage ratios (LCR), NSFR and ALMM, Fed 2052a, ILAAP and BCBS/EBA IRRBB. Enables reporting visualizations including IBM Cognos® Analytics or third-party business intelligence tools.